built up in their home. Naturally, this has it’s good points and bad points. Alternatively, some older homeowners opt to use a reverse mortgage line of credit or HECM line of credit. 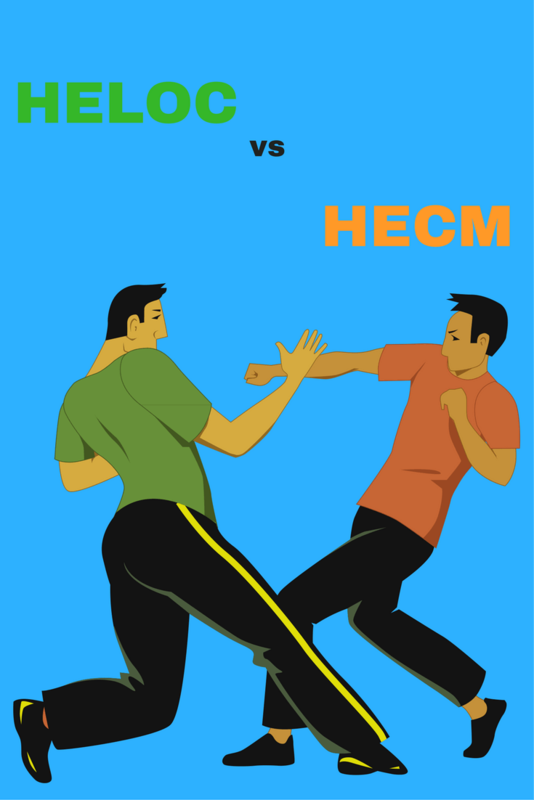 Similarly, using a HECM line of credit has it’s advantages and disadvantages when it comes to the HELOC vs HECM Reverse Mortgage debate. HECM is an acronym for Home Equity Conversion Mortgage. A HECM (also known as a reverse mortgage) is a special type of FHA insured loan for homeowners aged 62 and up. It allows you to access a portion of the equity in your home and convert to usable funds or money. The best part is, there is no monthly payment for as long as you live or for as long as you live in your home. Yes, there is no monthly mortgage payment to the bank, but you must continue to pay taxes, insurance, and home maintenance, as well as comply with loan terms. There are many different reverse mortgage payment options when you do a reverse mortgage. In this article, we’ll be focusing on the Line of Credit option. A HELOC will have a predetermined credit line amount. For example, you might get approved for $100,000. It will never be more (unless you qualify to get more at a later date). With a HECM line of credit, if your initial line of credit is for $100,000 it could potentially grow. Basically, an unused HECM line of credit grows at whatever your interest rate is PLUS another 1.25%. So, if your interest rate is 4%, then your unused credit will grow at about 5.25%. Hence, if you don’t touch your $100,000 line of credit for a year, your available credit will grow to about $105,378 (it’s a compounding interest calculation). If you didn’t touch that line of credit for 10 years and the interest rate stayed the same, then you’d have about $167,500 of available credit. Normally a HELOC has a set term. Usually it’s 30 years total. The term is generally that you have access to any available credit for a term of 10 years (called the draw period). Then, when the draw period is over, you no longer have access to money and your remaining balance gets amortized over the remaining 20 years. This can sting because you generally go from an interest only payment to a fully amortize payment set on a short 20 year term. In this case, an interest only payment on $100,000 at 5% would be $416 per month. When you fully amortize the balance of $100,000 for 20 years at 5%, the payment jumps up to $659.96 per month. That’s a big jump. The HECM term is open ended. Rather than having a set term like a 30 year loan, the HECM term is for as long as you live or for as long as you live in your home. It could be less than 30 years and it could be more than 30 years. It just depends on how long you live and / or how long you remain in your home (the home with the HECM has to be your primary residence). 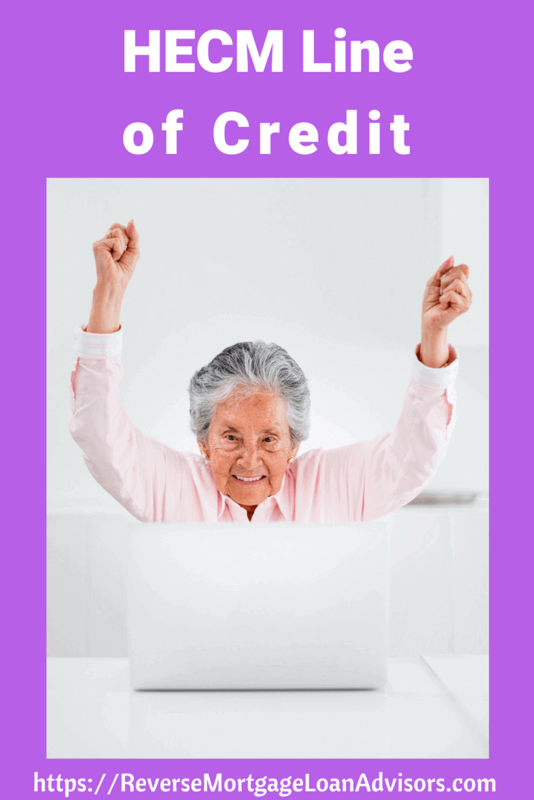 The HECM line of credit is guaranteed to not get turned off even if the market crashes and even if you live longer than a normal HELOC’s typical draw period of 10 years. Again, it’s guaranteed by HUD. However, a HELOC will at BEST remain “on” or not “turned off” for the initial draw period (normally 10 years). Aside from the normal draw period, if the housing market crashes the bank may reduce your available credit or turn off your ability to make further draws. It happened to me after the last housing bubble burst and my credit was perfect at the time. Once your HELOC is funded, the beauty is that it is REALLY easy to assess money. You generally just get checks, a credit card, or you can just go into the bank and access the money. This is one part of a HELOC that is currently better than a HECM line of credit. Don’t get me wrong, accessing the HECM LOC funds is easy too. It’s just not quite as easy as the HELOC. Basically, you fill out a short form and fax it to your servicer. You generally get your funds within 8-10 days. Easy Peasy, just not as easy as the HELOC, but still pretty simple. With a traditional HELOC the cost is usually pretty low and can sometimes come with no cost. A downfall of a HECM is that the cost can sometimes be a bit higher. Don’t let this phrase discourage you though, because there is such thing as a no cost reverse mortgage. It’s just not possible in EVERY case and it depends on the interest rate setting / market. When you apply for a traditional HELOC, naturally you have to be honest and tell your banker whether the home is your primary residence, secondary residence, or investment property. Let’s say that you take a HELOC now on your primary residence and then move. That may not trigger a maturity event (meaning the loan is called due). A reverse mortgage can only be done on your primary residence at this time. Further, if you move out, then this is considered a maturity event and the loan is called due. There are quite a few differences in the traditional HELOC vs HECM line of credit. In most cases, I feel the HECM is stronger than the HELOC. However, if you don’t plan on living where you are now forever, maybe a HELOC will suit you better. There you have it, a non-biased comparison of a HELOC vs HECM. Want more info from Reverse Mortgage Loan Advisors? Reverse Mortgage Loan Advisors Is not a lender, bank, or mortgage broker, nor is it affiliated with HUD or FHA. Reverse Mortgage Loan Advisors is simply a website designed to offer information about the FHA insured reverse mortgage program. However, the owner of the site is licensed as a reverse mortgage specialist in several states. Anyone that inquires and requests more information may be contacted by the owner of this site. If the owner of this site is not licensed to conduct business in the state you reside, one of our affiliates will contact you instead.